Garage Door Restore: Garage Door Maintenance Perth. A garage door, being the biggest opening of our house, is seriously difficult to maintain at a good condition. Though it is inevitable for our garage doors to be broken, there are a few steps that could help us prolong the lifespan of it. You may know some tips and tricks on Garage Door Maintenance, but it still would not be enough if you lack the expertise and experience in doing so. You have to take extra precautions and safety measures if you plan to check the condition of you garage door. But if you’re not sure you want to this, since accidents are unavoidable, you may ask for Garage Door Restore: Garage Door Maintenance Perth services at an affordable cost. – make sure to unplug the door. – Clamp locking pliers onto the roller track to keep it from dropping. – attempting to adjust or release the tension on an overhead torsion spring is strictly not recommended especially for those who have no experience. This can only be performed by professionals. – Do not remove a lift cable at all cost while a door spring is under tension. – Lastly, never place your fingers between the panels or any moving parts of a garage door whether it is operating manually or automatically. – Lubricate moving parts. Using thick grease to put on the springs, hinges, and rollers is not recommended since it will help accumulate dust and dirt, instead, use specific type of lubricants: sprays that are labeled for garage door use. – Inspect wear and tear. Look for signs of broken parts. Inspect all the hardware and moving parts of you garage door. If signs of damage are found, call for a garage door repair service to fix it. 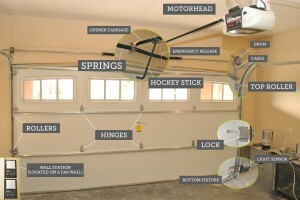 – Clean your garage door. You should clean you garage doors regularly if necessary. Use of sponge or cloth, dipped in warm water diluted with detergent is the best way to clean you garage door. Even if we try to be very careful, accidents are just inevitable sometimes. Garage Door Maintenance Perth offers services like repairing and replacing your garage doors. Sometimes, a little cost is worth all the risk.